See what happens when you use software that doesn't respect your freedom? Mostly because it still offers the possibility to install non-free software. 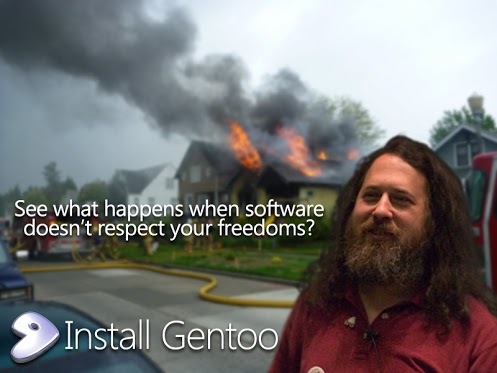 It's perfectly feasible to have a free gentoo installation and it doesn't really make it less free because Stallman says so. This is the only one I found :( If I had the time, I would write Trisquel there. It's what he's using, last I heard. Don't worry I use Debian and on my desktop and latop I have a few non free things but I try to keep everything as kosher as possible. I think I'm all good on all of my servers.